A set selection of 60 cards designed to provide a strong starting deck. A pitiful supply of cardboard damage counters. A heavily-creased paper playing mat featuring a rules summary and space for one player's cards. One of the playing mats. 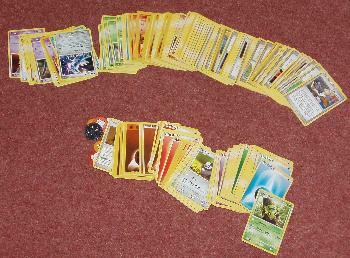 Gameplay: Each player has a 60-card deck containing pokémon cards, energy cards and trainer cards. Players have one active pokémon that's currently fighting and up to five substitute pokémon 'on the bench'. These are all laid out on the table. Players also have cards in their hand which they can use on their turn. Energy cards power up pokémon to make stronger attacks available; trainer cards allow things like healing. Active pokémon get one attack per turn and do damage to the opposing active pokémon. If a pokémon accumulates more damage than it has health, it's knocked out and has to be replaced by a substitute. 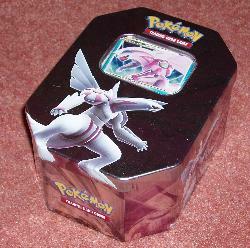 Pokémon can also be 'evolved' into stronger forms if the player has the right card. There are a few complications, like being able to swap injured pokémon for substitutes on your own go, but the basic rules aren't too complicated. Unfortunately, most of the newer cards have rather too much squint-inducing small print that makes the game vastly more convoluted without adding any real depth. Object: To be the first to knock out six opposing pokémon. Game length: The game takes fifteen minutes to an hour to play but creating a customised deck from a selection of several hundred cards can take days. Age: Officially 10+ but any child with enough reading ability to manage Harry Potter should be able to cope. 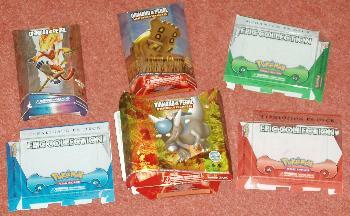 Comments: Last year, I gave a favourable review to a Pokémon Trading Cards starter pack I picked up for Sprog1. The game was simple to play, involved a good mix of strategy and luck and was reasonably entertaining. I did voice the suspicion that we might end up buying a few more cards, though. There are hundreds here... and these are only the ones I could be bothered to get out. Sadly, rather than making the game deeper and more challenging, they've really made it much less fun. We bought all three Epic Collection decks thinking they'd work well together and provide balanced games. They have a Rock, Paper, Scissors relationship, though, ensuring whichever two decks are used, one is bound to be superior to the other. The same goes for the Diamond & Pearl packs. It seems Pokémon Trading Cards isn't about playing an enjoyable, evenly-matched game of skill - it's about getting hold of the strongest cards you can and then obliterating your opponent. We've tried using the cards to make customised decks which produce a fair fight but it's harder than it looks. The complicated mix of weaknesses, resistances and special powers mean it's difficult to know how two decks will interact. Trying to work it out takes hours. Even when some kind of balance is achieved, it simply makes obvious how dependent the outcome of a battle is on luck. If either player manages to get cards to evolve a pokémon a couple of times early on and has a decent supply of energy cards, they're almost bound to win. The game might not be so bad if Sprog1 had a friend with a similar pokémon obsession (and moderate level of funding) whom he could battle and trade with regularly. As things stand, however, his big pile of cards is more collection than entertainment. Really, it should be both. Building the perfect deck takes planning and thought. The game requires a certain amount of strategy. Not extortionate if you stick to the theme decks. Building two perfect decks to create an interesting battle takes the organisational powers of a librarian. ...the rest are the result of purchasing superior cards. Like a black hole for money if you start on the booster packs.